For the first time ever, La Palina Cigars is teaming up with Rocky Patel on a new limited-edition cigar, but you'll have to visit an authorized TAA retailer to get one. 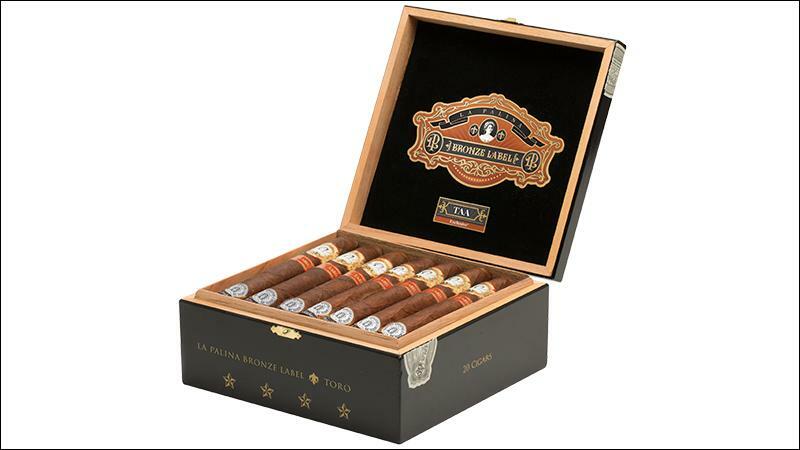 The collaboration is called La Palina Bronze Label, and it's set to debut next week at the 49th meeting of the Tobacconists' Association of America in Cabo San Lucas, Mexico. La Palina co-president Sam Phillips added that the Washington D.C.-based company is expecting to make Bronze Label a permanent brand with its own regular production sizes, but details are still forthcoming. As of now, the TAA size—a 6 1/2 inch by 52 ring gauge Toro—is the only vitola being released. The blend consists of a Habano-seed wrapper from Honduras, Honduran binder and filler tobaccos from Honduras and Nicaragua. The cigars are produced at Nestor Plasencia's El Paraiso factory in Honduras and distributed by La Palina Cigars. La Palina Bronze Label comes in boxes of 20 and slated to retail for $9.99 per cigar. A TAA footband denotes the exclusive size, which will only be available, in limited quantities, to members of the Tobacconists' Association of America, a retailer organization that represents American brick-and-mortar tobacconists. This is only the second year La Palina has release a TAA exclusive, following last year's Bill's Blend cigar. La Palina expects to begin shipping the cigars in late April or early May.